It is admirable that he is willing to use his own phenomenal playing ability to illustrate his theories, and to share his skill with colleagues in an open fashion. Since the growing success of my teaching method, I’m pleased to be able to offer International violin online lessons over Skype and lessons in person on the violin. I have designed and developed a unique method for learning to play the violin professionally called “The Shonert Technique”. This method works even for amateurs. 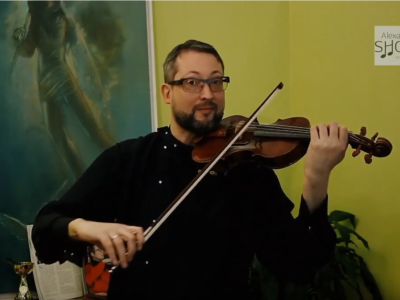 Although my method has benefited many advanced violinists and teachers around the world, The Shonert Technique will teach violin players on all levels how to learn to play the violin, and accelerate to advanced levels of playing in much shorter time than conventional techniques taught in many schools today. “The Shonert Technique” can be taught in person, master classes or online to all levels and all ages. I can also give preparation classes for the British ABRSM exam for all grades. I will not only help to improve your technique but also fine tune the quality of your tone and artistic expression. Finally I will prepare you for the final performance… professionally! The technique is very important for playing the violin, but it is just a way to achieve the main goal. The main goal is the music itself. So I pay special attention to musical interpretation and phrasing. How to Take Online Violin Lessons over Skype? What Equipment Do I Need for learning to play the violin online? First, you will need a computer with web camera, and have broadband internet connection such as DSL, Fibre or wireless. Then, you will need to download and install Skype communication software on your computer which allows you to make long distance and video conference calls to anyone in the world for free. You can download Skype using this link: skype.com./en/ (This is the English link, you will need different link for other languages). We can start your online violin lessons at once you send me your Skype name. What is The Difference Between Skype Lessons and private lessons for violin in person? To me, there are no differences except the student being online as opposed to being in the room physically and my teaching style caters for both online and physical students. Since Im unable to move about the room to see different angles of the student, I may just ask the student to reposition themselves more suitably in front of the web cam in order for me to give a more accurate assesment or correction. What Are The Benefits Of Skype Lessons? – Skype lessons are great if you live far from me. – You can learn from the comfort of your own home – no need to travel anywhere. – I will answer your questions outside of lesson time, via email. Why violin courses tailored to your level is important? Fixed online violin lessons on videos such as Youtube, will not take you very far. Everyone who has tried to learn to play the violin this way, knows about it. You meet a block, and nothing seems to work. The main reason is because everyone’s anatomy is different. For example, the recommendations that are effective for the artist with a short right arm may be completely useless to the artist with a long arm. It’s possible to see and understand it only live in person or through live video such as Skype when the artist is playing violin online. By observation, I will be able to know your current playing skills, discern your trouble spots, and offer the best course of action and solution to take. Many of my students from all over the world have benefited in this way. To make it easier for you to get started, I’m making a special offer to you below. I want to offer you a 20 minute lesson and consultation for free. You are under no obligation to continue. Should you decide to continue, we can make a schedule and agree about price. I look forward to meeting you..